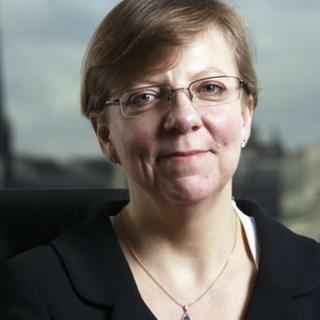 The new director of public prosecutions is to be Alison Saunders, the attorney general has announced. Ms Saunders will head the Crown Prosecution Service when Keir Starmer stands down in October. The career CPS lawyer has overseen some of the country's most important prosecutions and is currently the organisation's London chief. The DPP is the most senior criminal prosecutor in England and Wales, responsible for more than 6,800 staff. The role of Director of Public Prosecutions (DPP) is critical within the criminal justice system of England and Wales. The Crown Prosecution Service (CPS) is the organisation that can deliver justice by making independent decisions as to whether there is sufficient evidence to charge a suspect, and when it decides that there is, by prosecuting the case effectively. It works closely with the police but must always be seen to make independent and dispassionate decisions based upon the evidence gathered. It can only prosecute when it concludes that there is sufficient evidence for there to be a realistic prospect of conviction, and that the prosecution is in the public interest. The DPP is the hands-on, day-to-day head of the CPS - which is currently negotiating a period of austerity and modernisation. Maintaining public confidence in it will be critical. The Attorney General, Dominic Grieve, said: "Alison will make an excellent director of public prosecutions and is the right person to help the Crown Prosecution Service meet the challenges it will face in the coming years. "I am particularly pleased that Alison is the first head of the CPS to be appointed from within its ranks as proof of the high quality of the professionals that work within the service. "I'd also like to thank Keir Starmer for the great contribution he has made - not only to the CPS but more generally to the criminal justice system. He can be proud of the reforms that he and his staff have led to keep our criminal justice system one of the best in the world." Ms Saunders said: "I am delighted and privileged to be appointed as the next director of public prosecutions. To lead an organisation of committed and professional staff is an honour, especially having worked for the CPS since its inception." Ms Saunders spent the early part of her career prosecuting in south London before working on CPS policy in relation to child victims and witnesses. In 2001 she became chief crown prosecutor for Sussex and oversaw the prosecution of Roy Whiting for the abduction and murder of eight-year-old Sarah Payne. She then briefly left the CPS to join government as a deputy legal adviser to the attorney general. On her return, she set up the CPS organised crime division which deals with complex cases including human trafficking, drugs, counterfeiting and money laundering across borders. In 2009 Alison Sanders was named chief crown prosecutor for London, which deals with more than 200,000 cases a year. She oversaw the successful 2012 prosecution of two of the men who attacked and killed Stephen Lawrence in 1993. She also oversaw the huge number of prosecutions in London in relation to the August 2011 rioting, which led to 1,000 people being jailed.